Last week in Sydney and Melbourne law firm Clyde & Co conducted seminars reviewing 2017 through the workplace health and safety perspective. 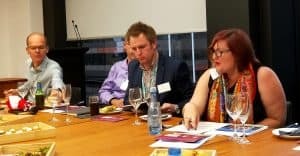 Alena Titterton (pictured right) hosted the Melbourne event which did not follow the proposed topics, but it was friendly and informative, and covered a lot of ground. This article focuses on the statistics presented in the Year in Review document and some commentary from Titterton.